Need to make a flavourful meal in about 15 minutes? Pasta and vegetables is one of my go to meals when time is short for cooking but I need big bold flavours, texture and it’s got to have vegetables. 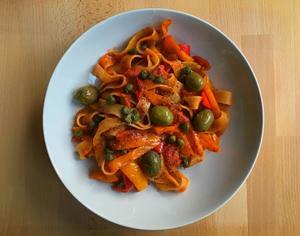 I love pappardelle—it’s so easy to cook with and you can use almost any kind of vegetable with it. Buy a good quality organic one if you can. There are two parts to this recipe. You can make both at the same time or start with the vegetables first or pasta. There is very little preparation involved. Add the peppers to a large pan and add some olive oil. Gently heat the pan with the lid on and let the peppers sweat. Once the peppers begin to go soft add the cherry tomatoes and oregano—cook for a few minutes. Add tomato puree, sea salt and cook for several more minutes. Add apple cider vinegar, black pepper and more olive oil—mix well. Check to see if you need to add more seasoning. Leave the lid on the pan and turn the heat off. Now to make the pasta. Pappardelle usually takes about seven minutes. Once done cool in cold water quickly. Turn the heat on for the vegetables to a medium setting. Add the cold pasta and gently toss everything to heat all the ingredients. Add more olive oil if needed. It should only take a few minutes. 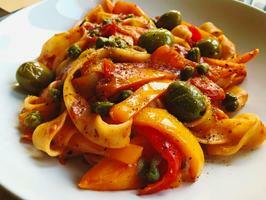 Serve the pasta in a pasta bowl or dish, add olives (generously) and capers. Enjoy!